One thing I love about the Greek people is their easygoing attitude towards life. It's so completely different from the day-to-day the way we're used to it, and it's also so easy to get used to. Punctuality? 2:30pm usually means between 4 and 6. Line-ups? Non-existent. And when it comes to directions… well I can’t tell you how many times I've asked how to get somewhere – be it the bus station, the train station, the port, or the nearest chicken giros pita stand – to be answered a smile, a bit of arm-gesturing, and, somewhere in there, the words “just take the second traffic light to the left.” It seems that in Greece all second traffic lights to the left lead somewhere. I truly believe in traveling by the seat of your pants, and grabbing every opportunity (within reason) that comes your way. That’s how, five years ago, I ended up spending two weeks in a station wagon named Phyllis camping along the east coast of Australia - several thousand kms from my planned destination. And it’s definitely how, one night on a beach in Santorini, under a full moon, when a guitar-playing Austrian asked if I wanted to travel with him down to a remote hippy island south of Crete that I’d never heard of in my life, I said, “sure!” first and asked questions later. So as much as I’d rather not, I have to fast-forward you through Santorini and Crete. Don’t get me wrong: Santorini, with its black sand beaches and white-washed houses, is magnificent. And Crete is an island of warm people and jaw-dropping scenery that will definitely have me going back for more. But what got us from Iraklio to Chania to Paleochora, and then up at 7 in the morning, lugging our packs 1.5kms back to the port where we caught the boat that leaves only twice a week, was Gavdos. Like I said, I’d never heard of it. Most of the Greeks we met along the way had never heard of it. In fact, most residents of Paleochora, from which Gavdos is only two hours (by sea), have never been. As we traveled South on Crete, and I heard more stories, I have to admit I became more and more apprehensive. But nothing beat our arrival to Gavdos on Wednesday afternoon. It started when I stepped off the ferry and onto the island’s one bus, (which runs, as it would, on its own schedule depending on the mood and sobriety of the driver.) I stared in awe out the window as we wound through dusty roads and past the homes of the twenty to thirty permanent residents of the island. I started to worry when we got off at one of the two functioning tavernas. And when we walked for what seemed like hours over old, craggy coral reefs, covered in sweat, I was really started to lose faith. Especially when we reached Agios Ioannis Beach, which, unlike our previous campgrounds (and despite my desperate hopes), had no toilets. No showers. Definitely no electricity. And, at least it seemed at first, no one else. I know what you're thinking. But believe it or not, I adjusted to life on Gavdos pretty quickly. And it’s not just because I had no choice. (Even if I had run, screaming, back to the port, the ferry back to Crete wouldn't have come for another five days.) In fact, in no time at all, I came to love the place. In fact, I think that, put in that kind of environment, our minds and bodies just sort of ka-chung into a perhaps previously undiscovered gear. I would never have guessed that I would feel so good in a place where the sea was my shower, my bath, and my dishwasher. 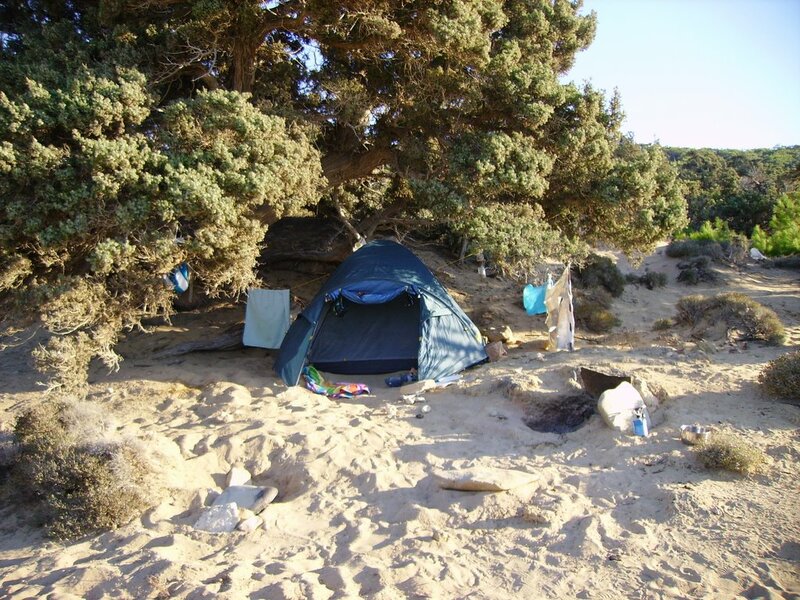 Where my home for 5 days was a tent on a sand dune under the shade of a cedar tree overlooking a massive beach. Where sand was literally EVERYWHERE (food, sleeping bag, nose). Where in a bikini I was wearing more clothes than most of my neighbours. Let me tell you, meeting someone over some wine at a campfire and seeing him the next day playing Frisbee and wearing only a hat and sunglasses is definitely an experience. The closest shop to Agios Ioannis is about a 20 minute walk away and the nearest shower (which, I admit, I snuck into just once) was 30 more. But despite all this - despite my hair getting so salty I could have used it to season a dinner for 4, despite the lack of internet and Perrier - those five days at Gavdos had me feeling better than I ever remember feeling. And in a place so full of nothingness, it’s amazing how there’s so much to see, taste, smell, hear.... Like the view from the lighthouse, which we got to by motorbike (and a prayer), of a sea is so wide and vast you just get lost, and of sunsets are, by picture or a million words, indescribable. The feeling of sitting on the beach at the south of the island, which literally is the southernmost tip of Europe. 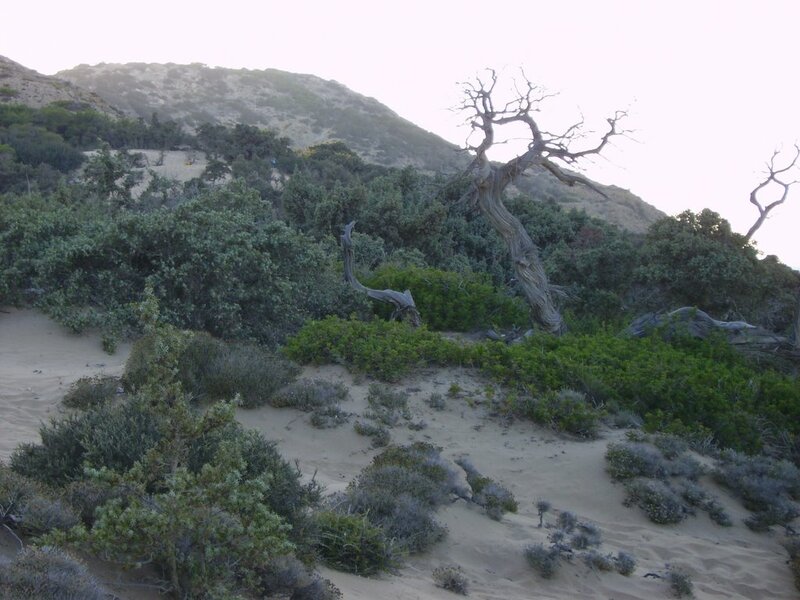 The tastes of freshly picked thyme that grow from the bush next to your tent, the smell of the air in a place that has, at most, 15 cars, the nothingness of sand dunes that are your carpet to the sea. 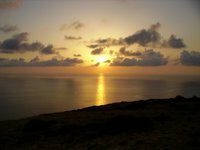 Imagine lying under the clearest, starriest night skies while watching thunderstorms over the ghostly outline of Crete, and hearing no sounds – no buzz of electricity even – except the ocean, and, okay, the occasional pan flute from down the beach. I’m not sure I even can anymore. Because 5 days later, I was standing in a red phone box at midnight, wearing all my clothes on top of one another and still shivering. Oh yes: London. And that's for next time.